The Islamist militant Hamas movement on Sunday raised the prospect of exchanging an Israeli soldier declared dead in the territory’s 2014 war in return for Palestinian prisoners. Abu Obeida, spokesman for Hamas’s military arm, the Ezzedine al-Qassam Brigades, said that “the resistance has… cards in its hands that will force the enemy to release you”, referring to prisoners in Israeli jail. Israeli soldiers, dead or alive, have in the past proved valuable bargaining chips. 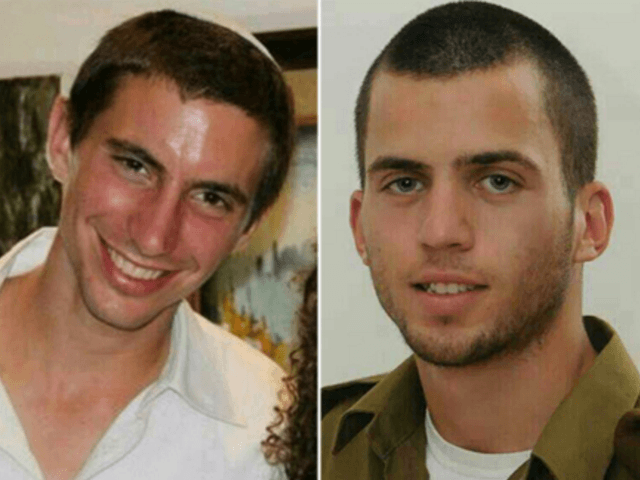 The bodies of two soldiers killed in the 2014 Gaza war, Oron Shaul and Hadar Goldin (pictured), are believed to be held by Hamas, which has not clarified their fate. On Friday, the movement’s Gaza chief Ismail Haniya said Qassam Brigades were preparing “for any future clashes with the Zionist enemy”, including by building tunnels on the border with Israel. He said a collapsed tunnel that killed seven militants in Gaza last week was like the one used to capture Shaul and that led to the release of Palestinian prisoners in return for Israeli soldier Gilad Shalit in 2011. The tunnels were “strategic weapons” against Israel, Haniya said, adding that Hamas fighters were also training and acquiring “all the means to fight and resist”. Senior Hamas official Khalil al-Haya drove the point home on Sunday. “The tunnel in which our seven martyrs died is the same one that was used by Qassam to capture the soldier Oron Shaul,” he said. Israel has accused Hamas of rebuilding tunnels destroyed during the 2014 war with the aim of launching fresh attacks against it. The 50-day war in July-August 2014 killed 2,200 Palestinians and 73 people on the Israeli side, and it destroyed or damaged thousands of homes in the besieged Gaza Strip. The tunnels have been used in the past to store weapons or stage attacks. On Sunday, Israeli Prime Minister Benjamin Netanyahu warned Hamas against any attempt to attack his country. “We are systematically preparing for all threats — including from Hamas,” he said. “If we’re attacked through tunnels from the Gaza Strip, we’ll act very forcefully against Hamas, with far much greater force” than two years ago. “I hope we won’t need them, but our abilities — both defensive and offensive — are developing rapidly, and I wouldn’t recommend anyone tries them,” he said in a speech to Israeli diplomats.